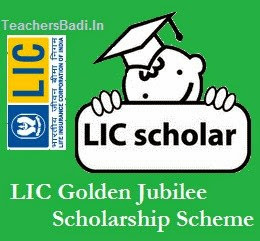 LICGJF #LIC Golden Jubilee #Scholarship Scheme 2018 Notification, LIC Scholarships, LIC Golden Jubilee Scholarship Scheme, Scheme of LIC Golden Jubilee Scholarship; Scheme of LIC Jubilee Scholarship for Students belonging to the economically weaker families for pursuing higher studies: LIC Golden Jubilee Foundation to be issued a Scholarship Scheme notification in September 2018 for award scholarships to meritorious students for this year. LIC Golden Jubilee Foundation invites online applications from the eligible students. This scheme objective is to award scholarships to meritorious students belonging to economically weaker families so as to provide them better opportunities for higher education and thus enhance their employability. For i) above Candidates who have passed Class XII exam or equivalent in the Academic year 2015-16 with at least 60% marks or equivalent grade and annual income of whose parents/guardian from all sources does not exceed Rs. 1,00,000/- per annum. An amount of Rs. 10,000/- per annum will be awarded to the selected candidate which is payable in ten monthly installments of Rs. 1,000/- each. The Scholarship amount will be transferred to Bank Account of the selected scholar through NEFT. Therefore in case the candidate is selected for scholarship, the Bank Account details and IFSC code are compulsory. (i) Scholarship shall be awarded to the students who have secured not less than 60% marks or equivalent grade in the previous final examination and the annual income of whose parents/guardians from all sources does not exceed Rs.1,00,000/- per annum. (vii) If a student violates any terms and conditions of the scholarship, the scholarship may be suspended or cancelled. (viii) If a student is found to have obtained a scholarship by false statement/certificates, his/her scholarship shall be cancelled forthwith and the amount of the scholarship paid shall be recovered, at the discretion of the concerned Divisional Administration of LIC. Mode of applying only online applications are to be submitted through the given link. Once online application is submitted, the candidate will get acknowledgement at the email ID provided by him in his online application. Further correspondence will be made by the Divisional Office which is mentioned in the acknowledgement mail. The candidate should ensure to submit his correct email id and contact number for communication at a later date, if required. Bank Account details and IFSC code are not compulsory at this stage. At present our Divisional Offices are processing the online applications received from the candidates. The students will be contacted if they are shortlisted.